Welcome parents to St. Francis de Sales Pre-K! Check out the Announcements and Events page for updates. Thank you for sharing your child with me! Kathleen Hall is the pre-kindergarten teacher and she teaches religion to pre-kindergarten students. She has 14 years of experience teaching and holds two Bachelor of Science degrees from Salisbury University. She also has a certification in early childhood education. 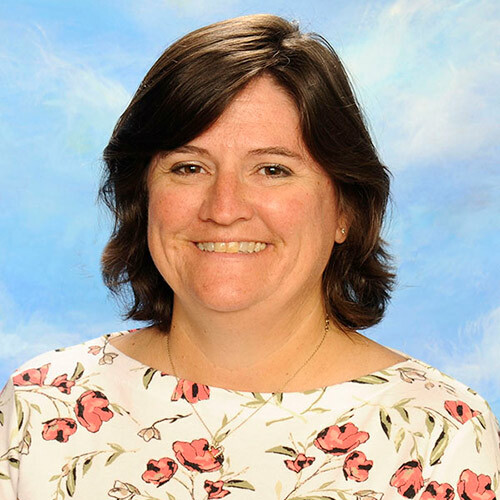 She has taught at SFdS for 10 years and uses problem-based and purposeful play-based learning in her classroom to prepare students for kindergarten. Problem-based learning helps students learn in a group or individually to do things for themselves. Purposeful play teaches the many social and academic skills needed to become ready for kindergarten, including letters and math. Each student’s progress is measured through a variety of assessments and observations and each student is encouraged to become independent thinkers with the use of hands-on educational materials. This week we will talk about the letter Y. We will start talking about our resurrection eggs this week and I will be sending a set of resurrection eggs home with each student the last day before break. You will really enjoy how they sell the story of the Passion with you. We will also be talking about yarn, yachts, yellow and Mr. Yuk. We will talk about where yarn comes from and what you can make from it. We will talk about yachts and what colors we can make from yellow. We will talk about the Mr. Yuk sticker and why and what it was created for – which is to save little children. We will make a giant poster for you to put up somewhere in your home to have just in case of emergencies. What saint are we talking about this week? Why is this saint a saint? What sound does an Y make? Show me Y in sign language? What can you make with yarn? What colors can you make from yellow? What is Mr. Yuk’s phone number? I have some suggestions for you to do at home that will help your student become an independent learner. I will also share some articles for parents from time to time that you may find of interest. Do you know what is missing from this word? UR- See you at Church this weekend! 1 non-spill water bottle (to use for snack) *** must have**** So the bottle does not spill when they are using it and it gets knocked over. See photos below. During the year I will ask for 2 – 2-liter bottles and 1 12 count egg carton. Nap Mat – Must be 19”X45”X5/8” to fit into the storage space. We have a small supply here at school. You MUST label your child’s lunch box, backpack and uniforms, especially sweatshirts, jackets/coats and sweaters. The uniforms all look alike and I will have no idea whose it is once it is taken off.